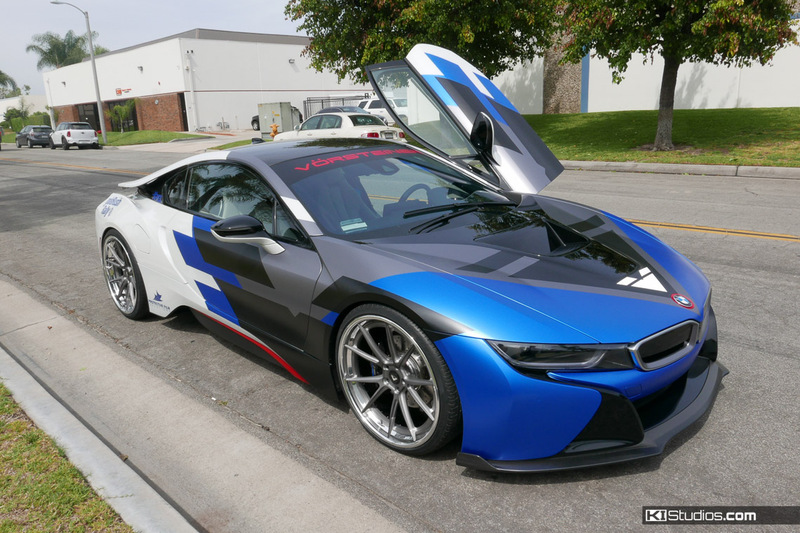 This BMW i8 layered wrap project for Vorsteiner was done in collaboration with our partners Protective Film Solutions. It features a full body, layered wrap with branding graphics. 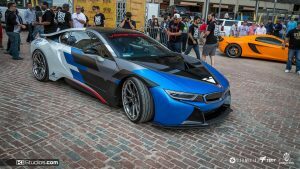 This is the Vorsteiner BMW i8 with a layered wrap by KI Studios. 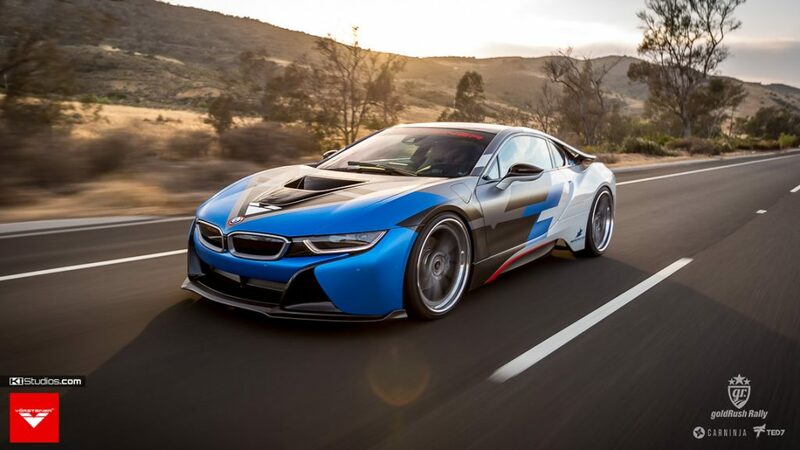 There are few hybrids as cool as the BMW i8. 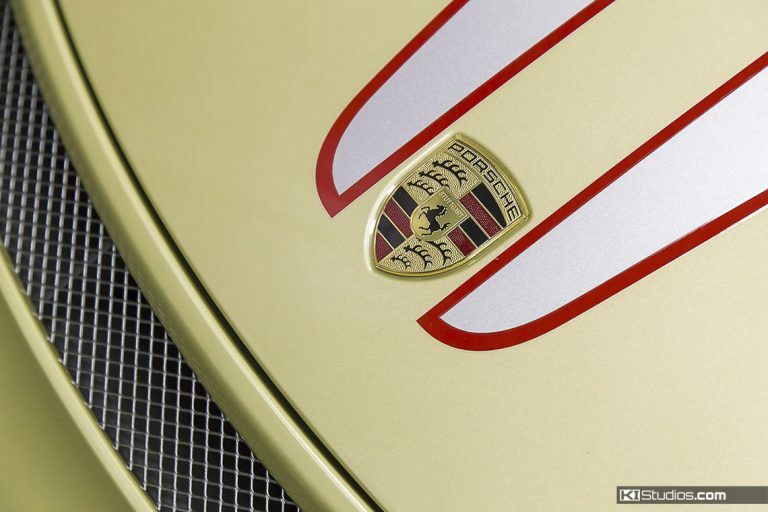 The only ones we can think of are way up there with the P1s, the LaFerraris and the 918s of this world. In fact, that’s probably all of them right there. This very special BMW i8 was brought to us by Vorsteiner for this layered wrap. The BMW i8 wrap project is to follow Vorsteiner’s branding, which is clean, modern and edgy. 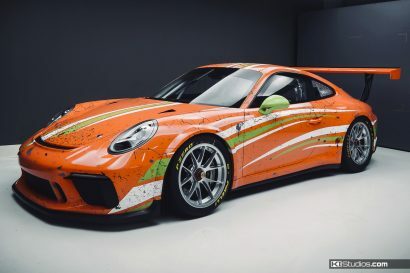 The car is to match their Porsche Cayman GT4 with a different set of colors. Layered wraps are extra complicated. They require careful planning, more material and extra installation time. You need a lot of experience with these sort of wraps in order to avoid the common pitfalls associated with them. For example, you need to really plan ahead to where your seams and overlaps are going to be. If not, you can end up with unsightly lines in your wrap. If you are combining printed sections with layered sections you need to plan ahead for that as well. 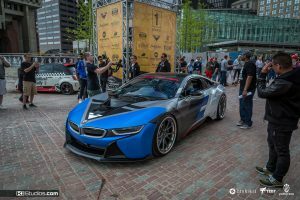 This particular BMW i8 was driven in Gold Rush Rally 2016. The car is unique in many ways and stands out in the colorful rolling circus that is Gold Rush Rally. One big reason for this is because the design is so clean and classy. 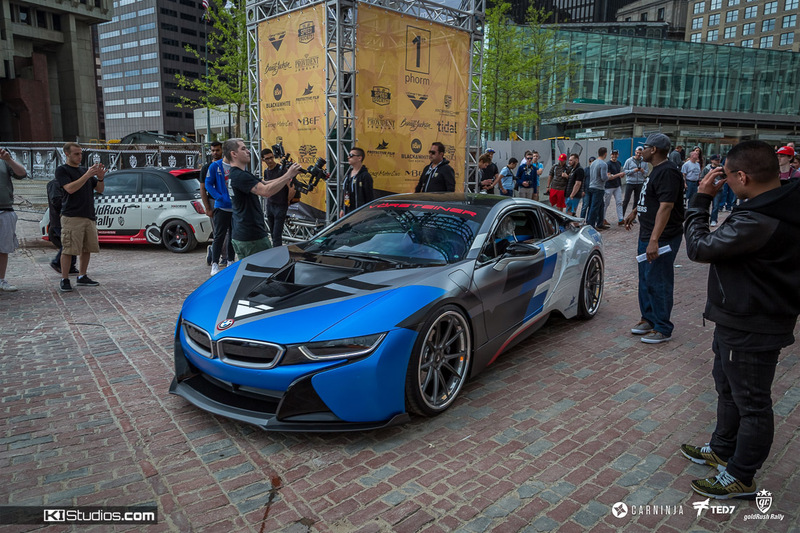 It really goes perfectly with the Vorsteiner brand. Most of the shots are by Ted 7. We specially love those rolling shots. Be sure to also check out the Vorsteiner Porsche Cayman GT4. 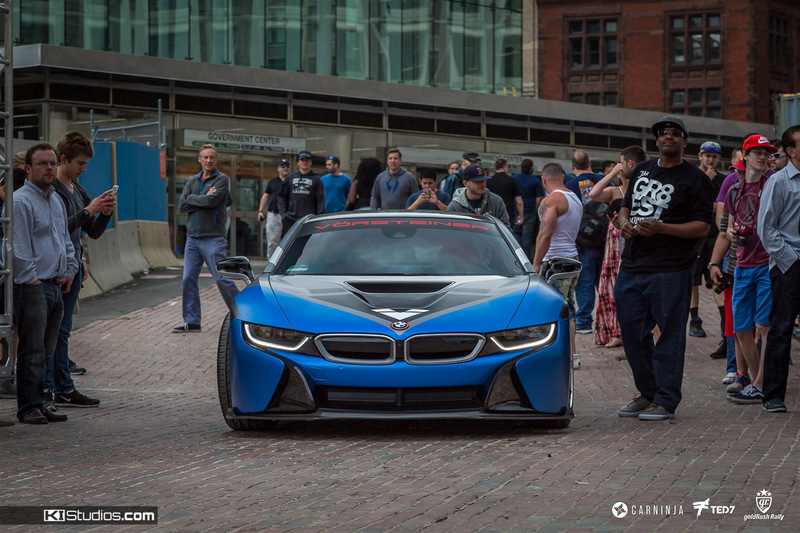 The BMW i8 is BMW’s interpretation of the hybrid super car. The car is interesting among hybrids as it uses a very unconventional 3-cylinder engine coupled with an electric motor. The drivetrain works in more or less the typical hybrid fashion. It does have a lot more power than your average hybrid though. 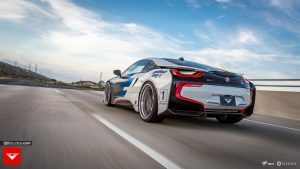 The car produces 357 hp and drives all 4 wheels. That puts it at 60MPH in only 3.6 seconds. The car is designed for power and speed. For this reason, MPGe is not like that of most hybrids and only turns out about 26MPGe. That’s fine though. 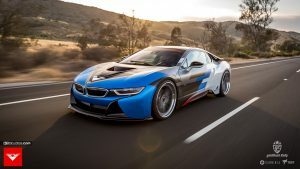 If you buy a BMW i8 you’re looking for power, torque and uniqueness, not gas savings.